It loses something without the 3-D glasses. 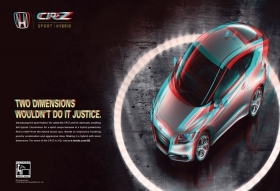 But Phantaglyph technology will make the print ads for the CR-Z hybrid jump out at the viewer. For the launch of its CR-Z hybrid coupe, Honda has little use for standard media. The automaker is making no paper brochures. Information will be entirely digital, accessible only by computer or through an iPod, iPad or Android application. "For products like Accord and Civic, we wouldn't do this; it's too broad an audience," said Tom Peyton, Honda brand manager. "But for a product like CR-Z, where you can have pop-up displays and Flash video, it makes sense." Using a new 3-D technology called a Phantaglyph, Honda is creating print advertising that makes the car seem to rise off the page. With 3-D glasses, the Phantaglyph appears more lifelike than other 3-D renderings. The first ad will appear in Maxim next to an article about former professional tennis player Anna Kournikova. But the biggest 3-D viewing will be in Times Square on Sept. 23, when Honda will hand out thousands of pairs of 3-D glasses to see the ad on a 40-foot TV screen that Peyton said "will look like a hologram, at a fraction of the cost."